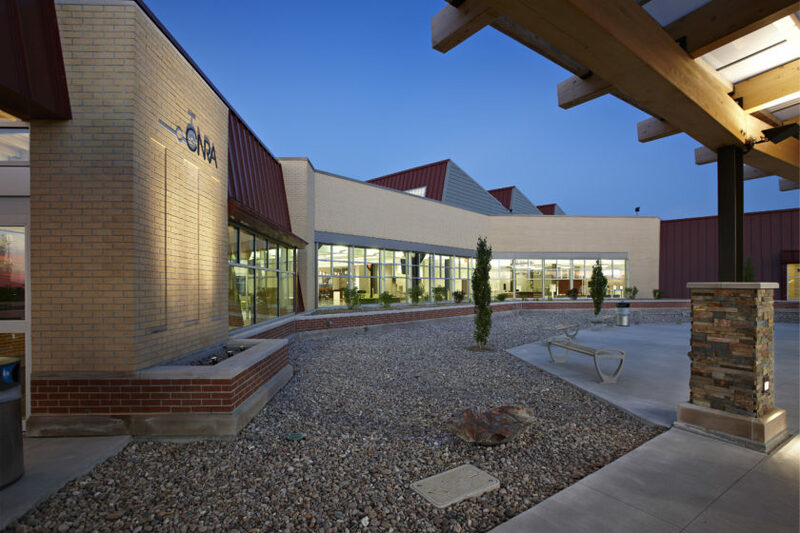 The campus of the Central Nebraska Veterans Home is comprised of 11 buildings on a 67 acre site in northeast Kearney. 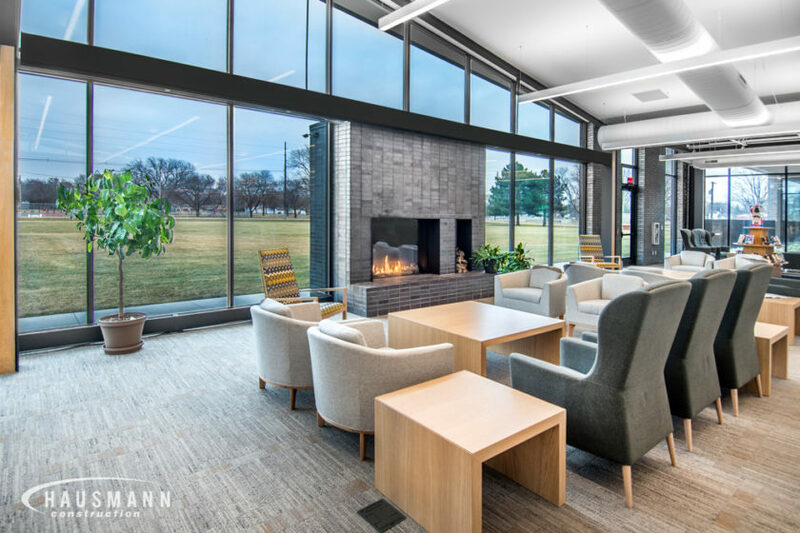 The Veteran’s Home Center (VHC) is the main building at 75,000 square feet and features facilities administration, food service, clinic, wood shop, craft area, chapel, and large group gathering spaces. 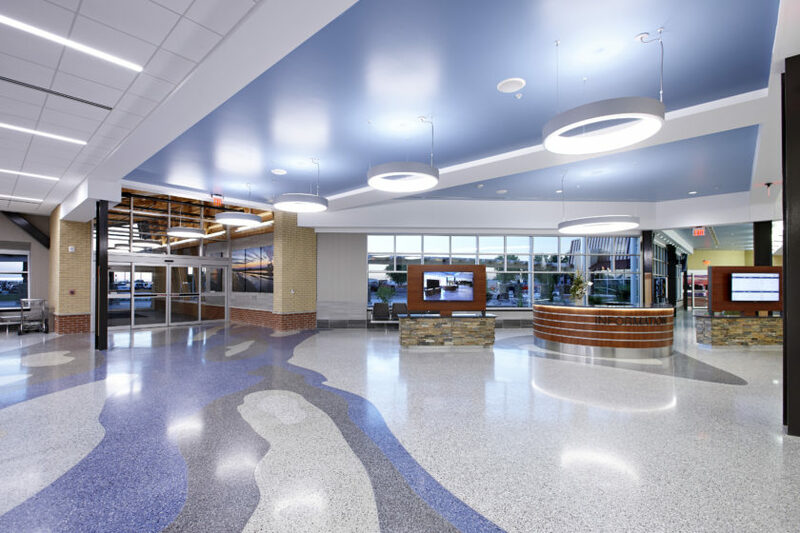 On each side of the VHC is a HUB building at 13,000 square feet each, which primarily supports physical therapy needs. 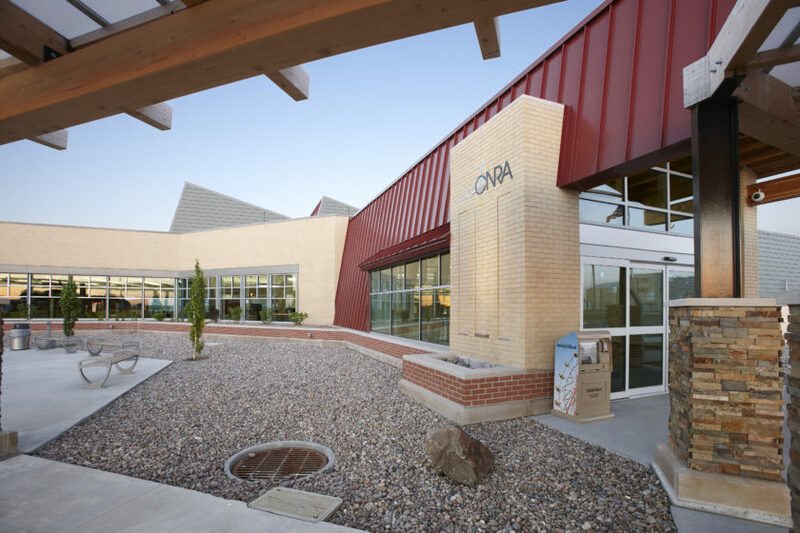 Six neighborhood buildings ranging from 34,000-38,000 square feet are the living quarters for the Members (Veterans). Each neighborhood has three homes and has 12-15 Member bedrooms for a total of 225 units. 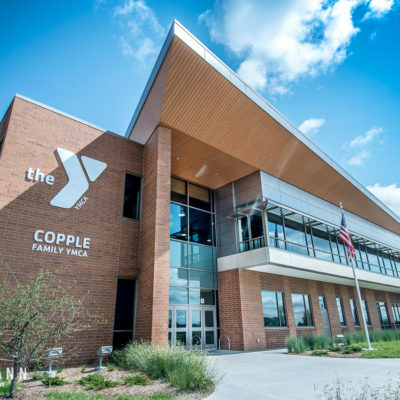 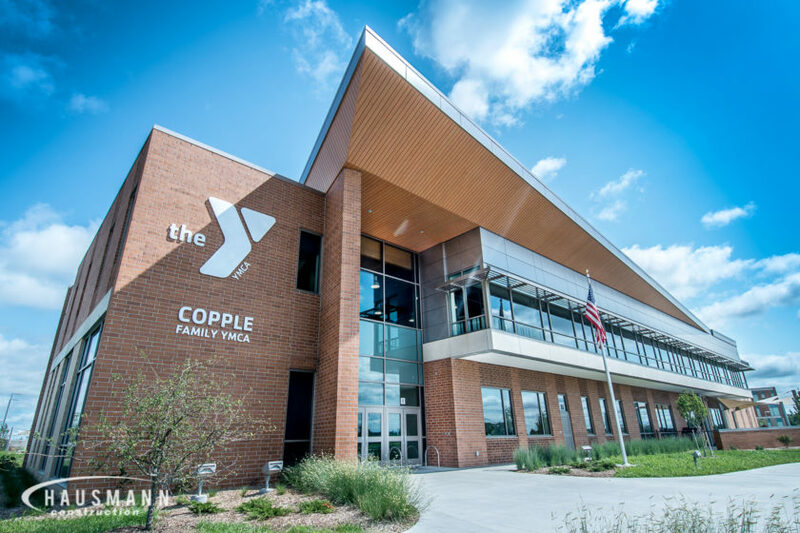 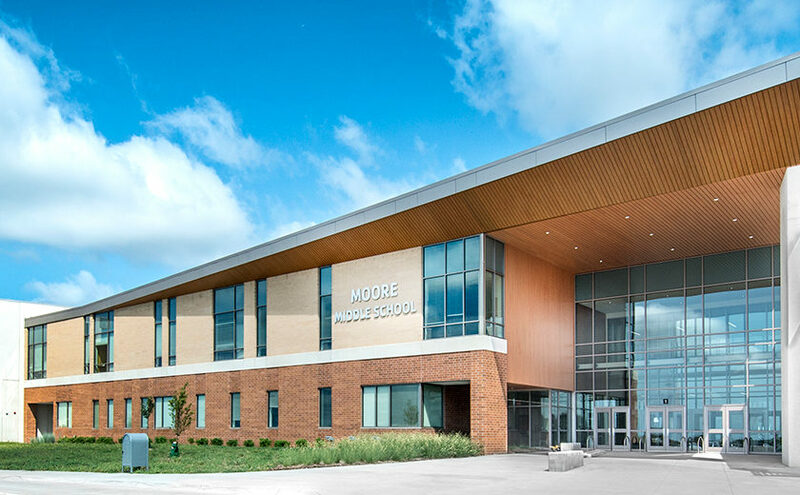 The Marilyn Moore Middle School and Copple Family YMCA project is the product of a unique partnership between the Lincoln Public Schools and YMCA of Lincoln. 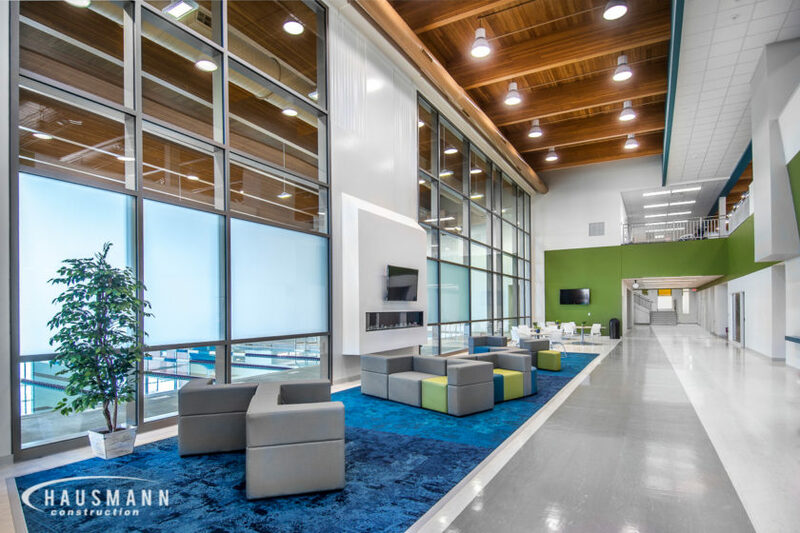 The 243,291 square foot facility is noteworthy for its use of nearly every structural element available in the industry. 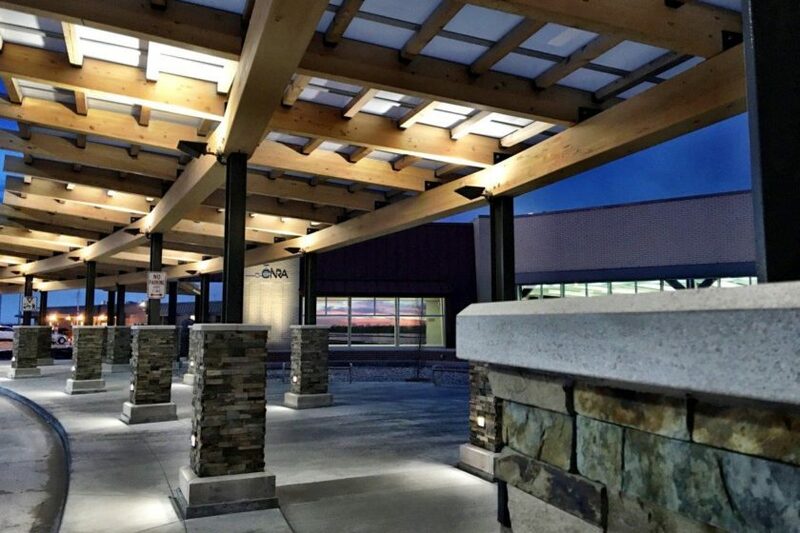 Precast columns, beams and panels, structural steel, CMU and glue-laminated timber all added important function and aesthetic to the building. 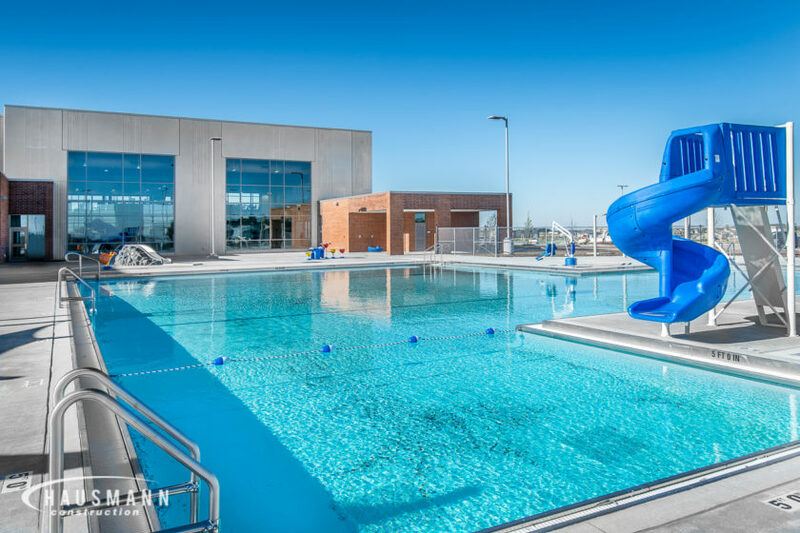 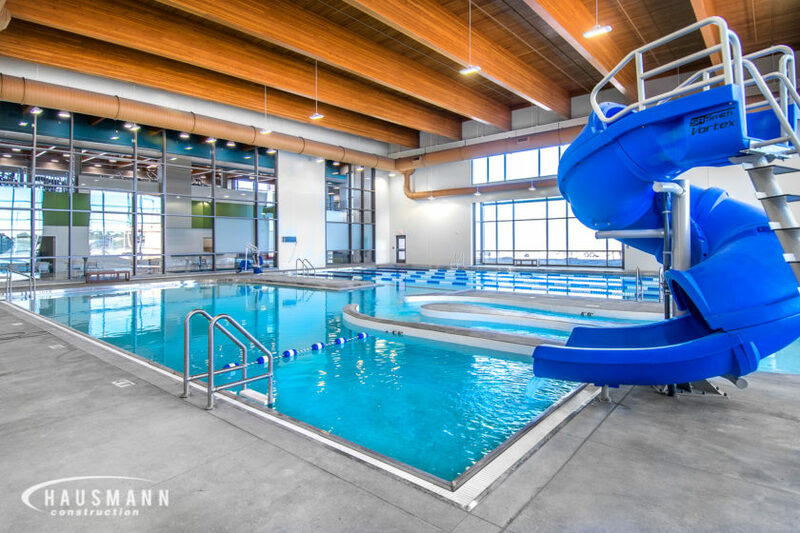 The project also incorporated both indoor and outdoor swimming pools, a water track, spa and splash pad. 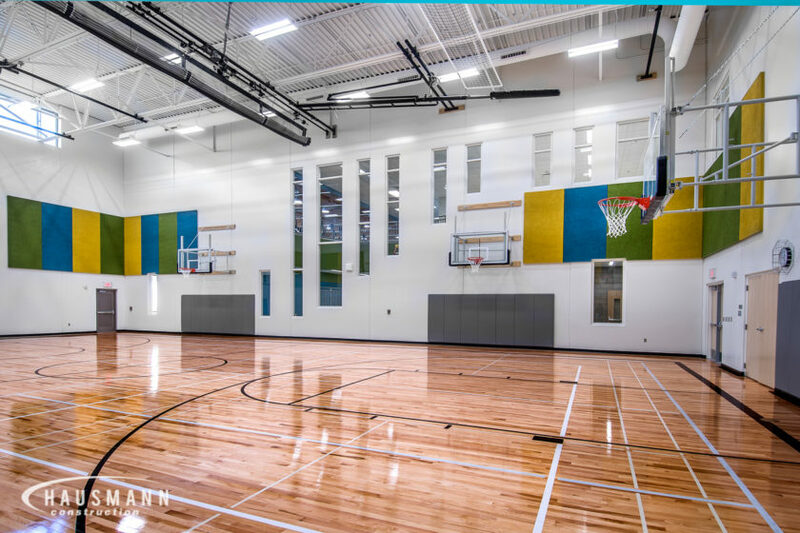 More than 298 geothermal wells fuel the facility and three indoor gymnasiums create space for intramural sports, tournaments and other activities. 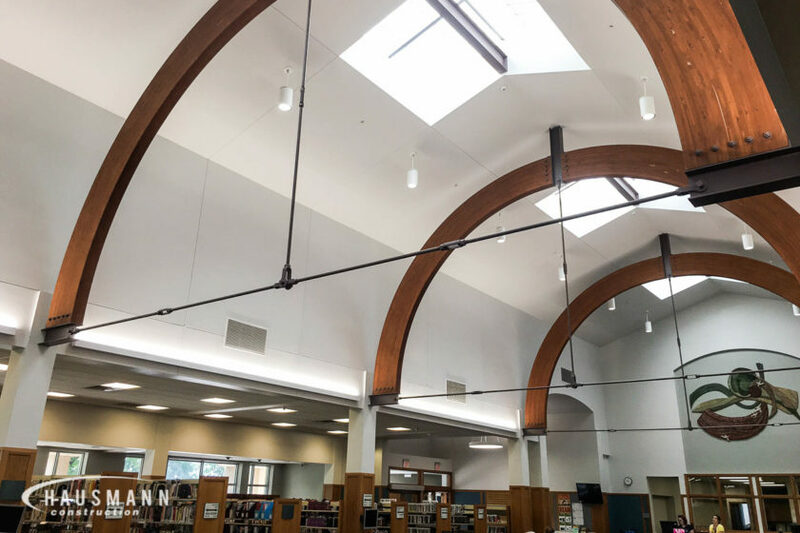 Norfolk Public Library is a 16,000 square foot addition and a 20,000 square foot renovation project. 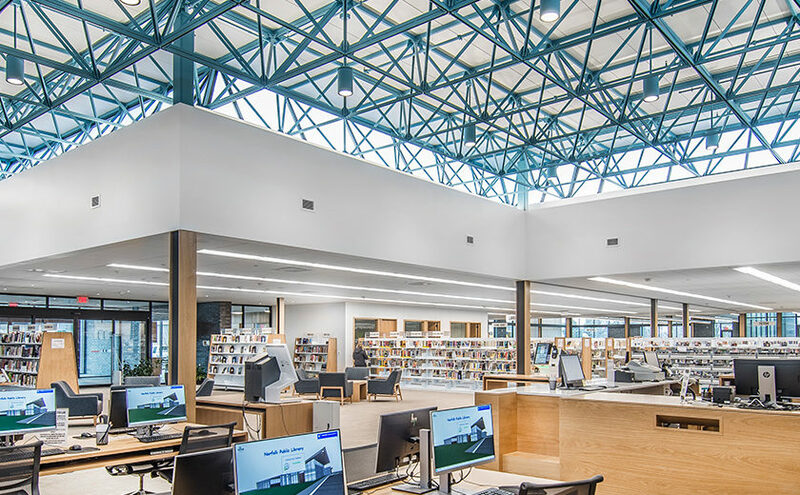 Phased construction allowed the library to remain operational throughout construction. 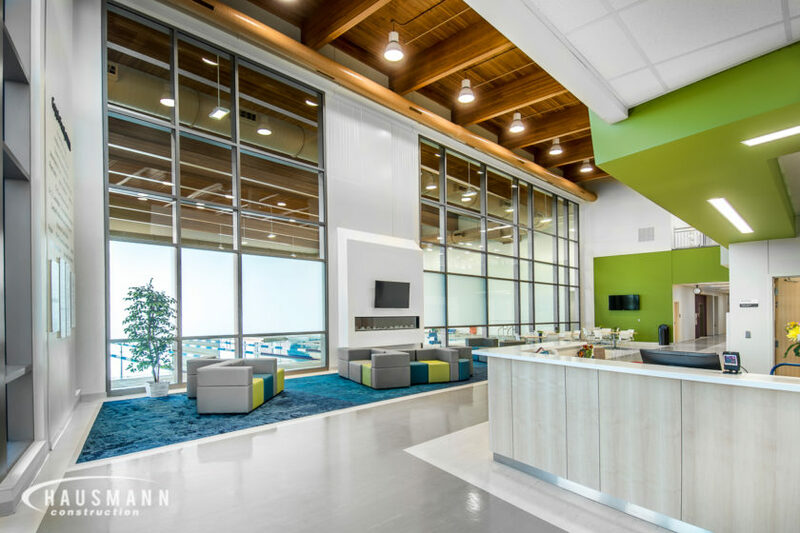 Presented Value Engineering options to the owner and design team, which created project savings for the owner without reducing quality and without redesign. 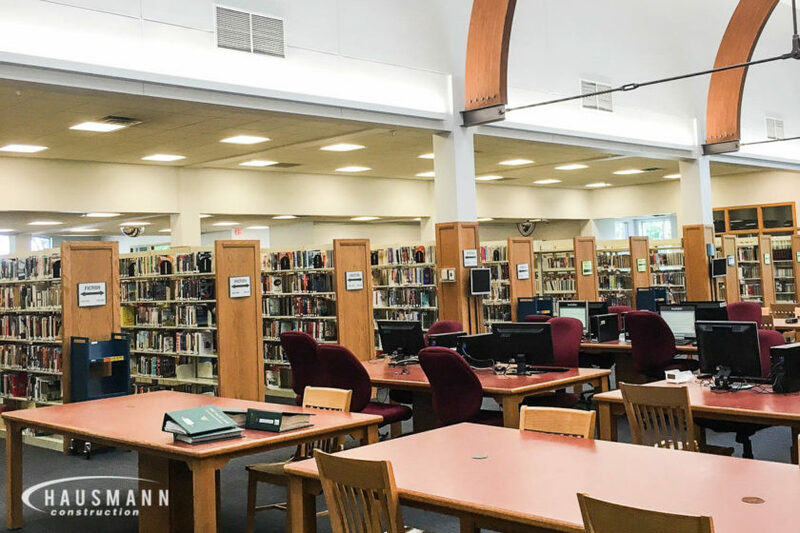 The library now offers a new and improved library, learning commons, study area and student spaces. 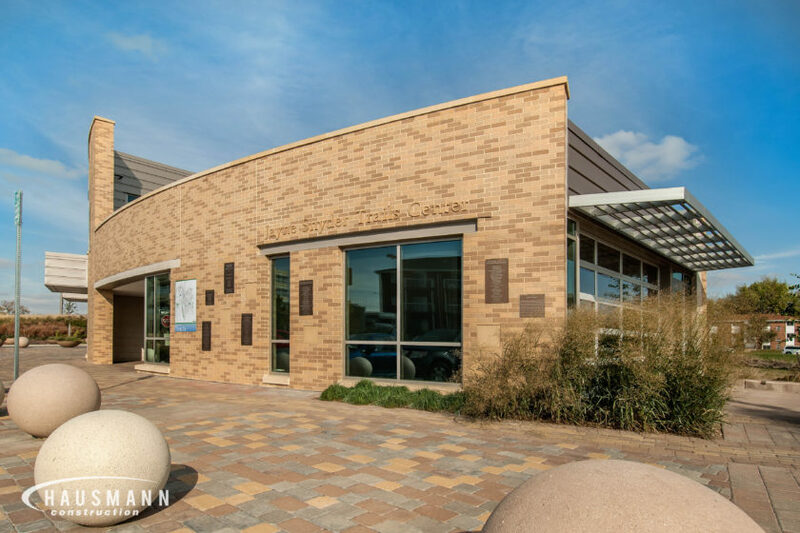 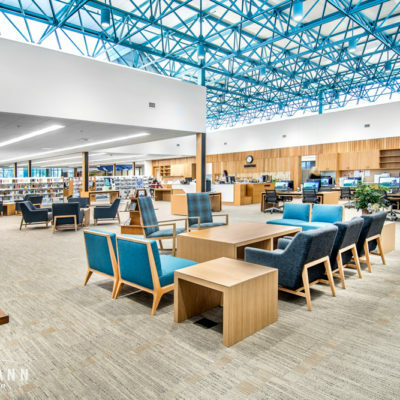 The Sump Memorial Library project, located in Papillion, NE, was a renovation to an occupied city library. 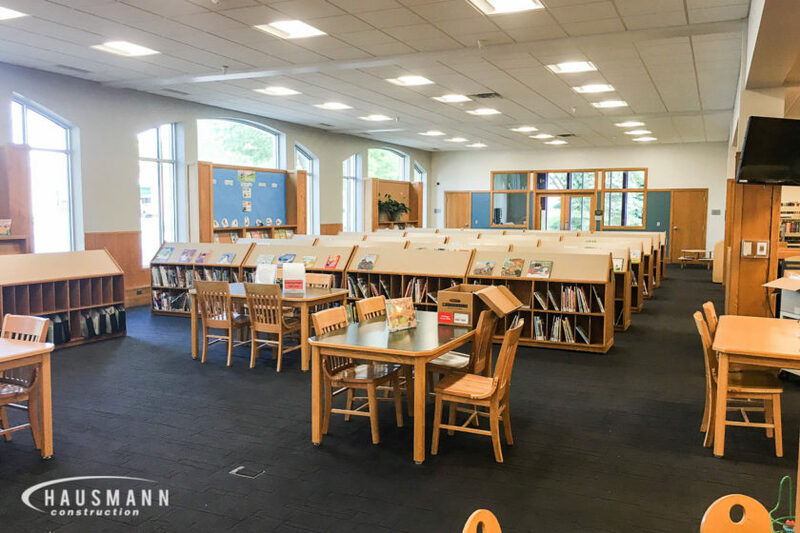 Upgrades included new flooring and paint, six restroom renovations, new ceilings, new large circulation desk and upgraded lighting throughout the building. 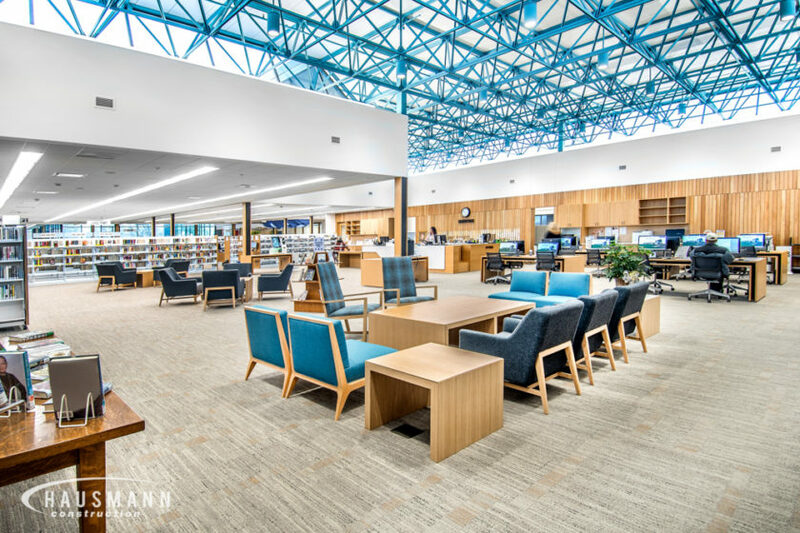 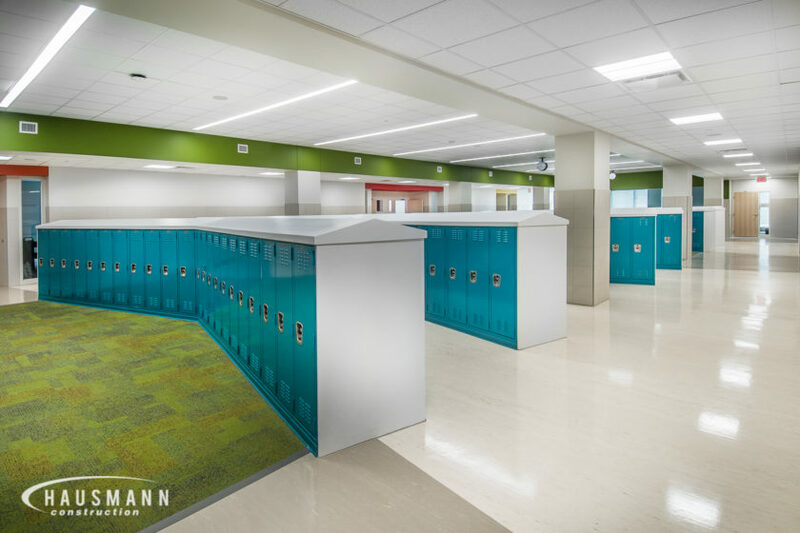 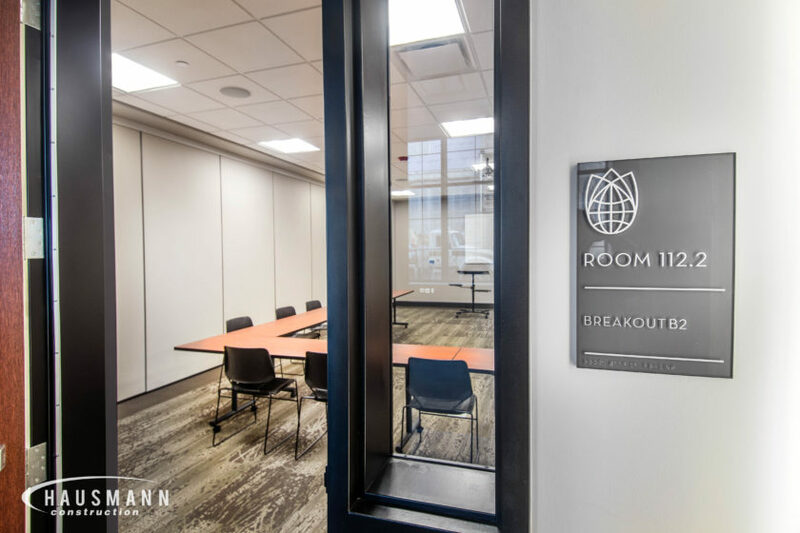 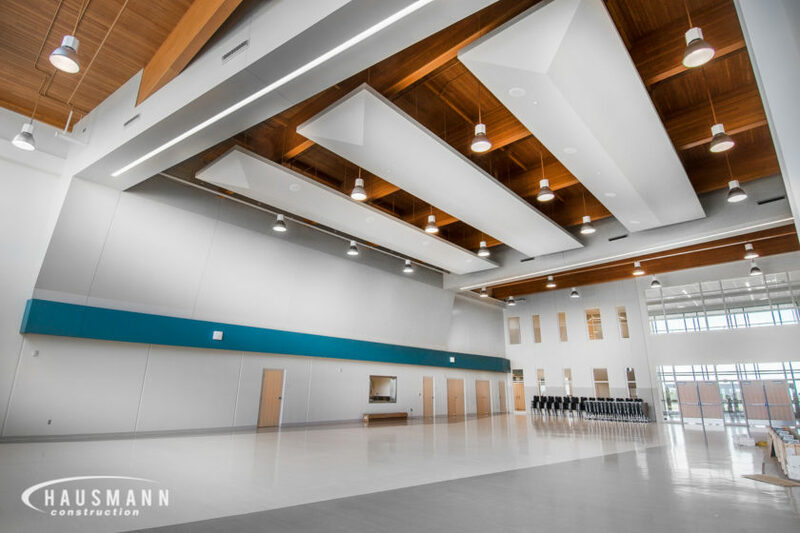 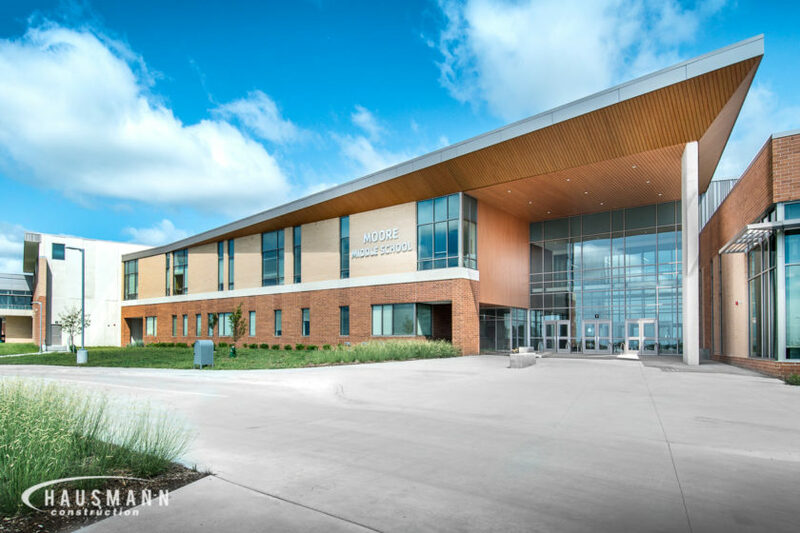 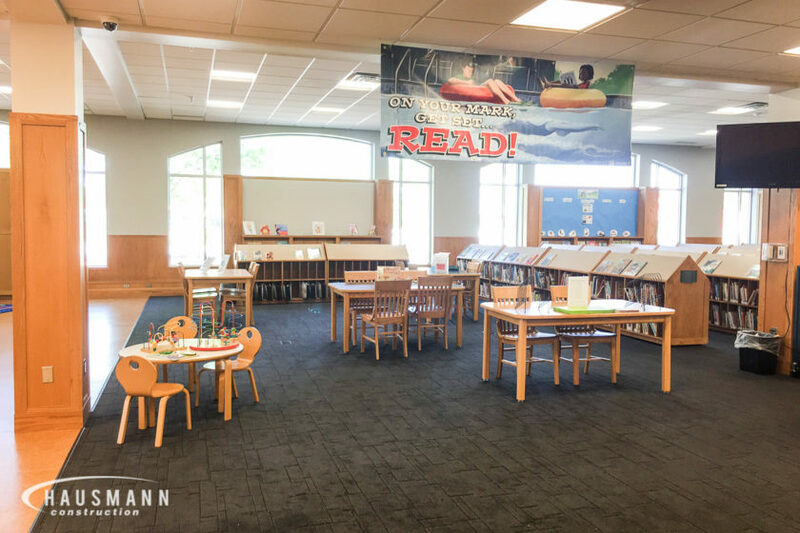 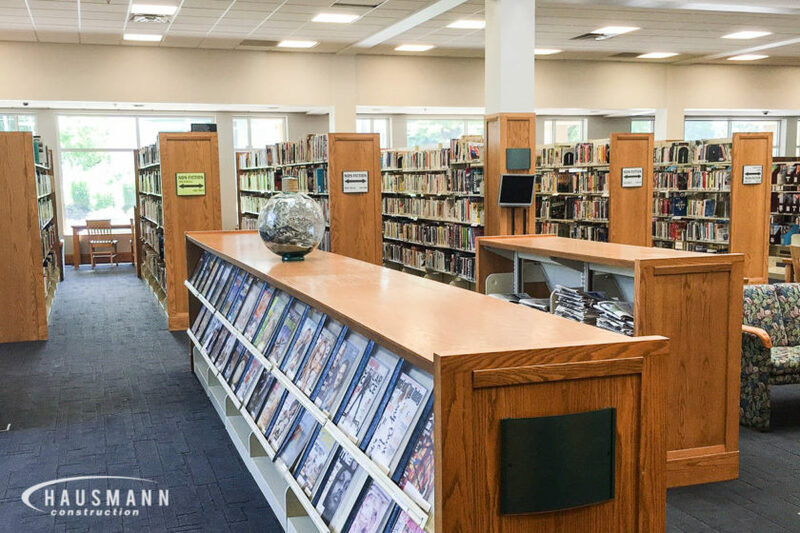 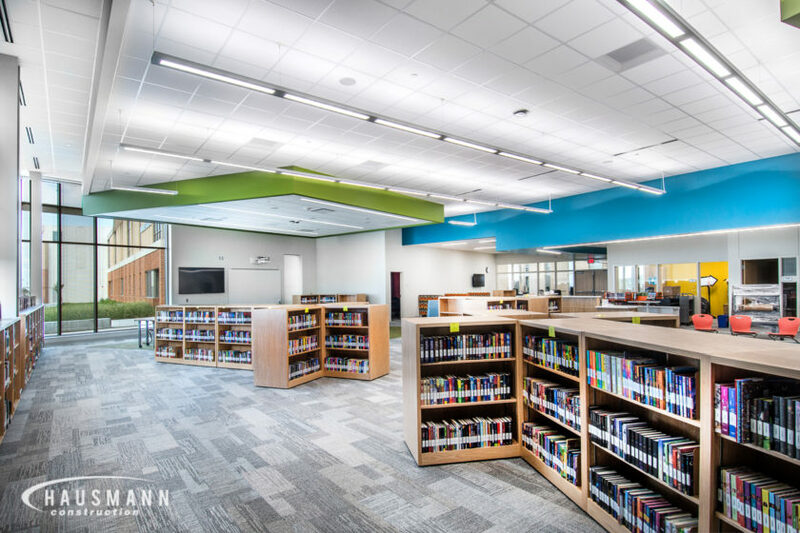 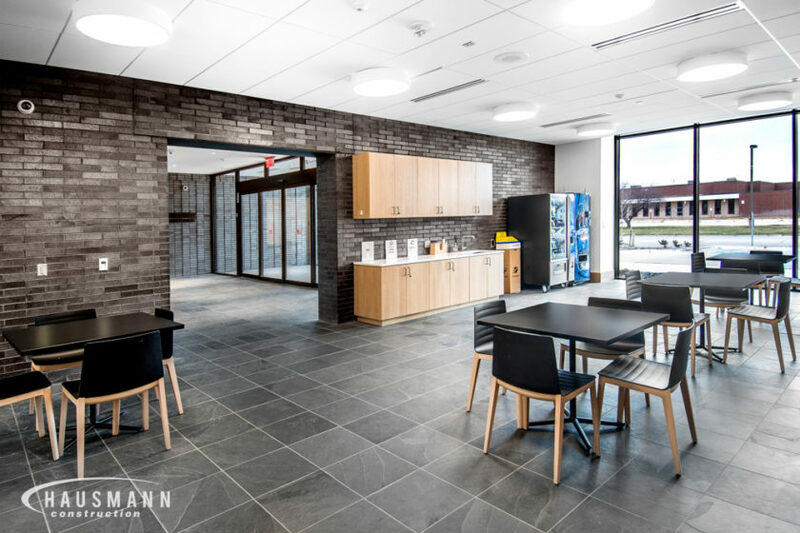 The library remained open throughout the project and Hausmann was able to work with the Owner to keep the project under budget and on schedule. 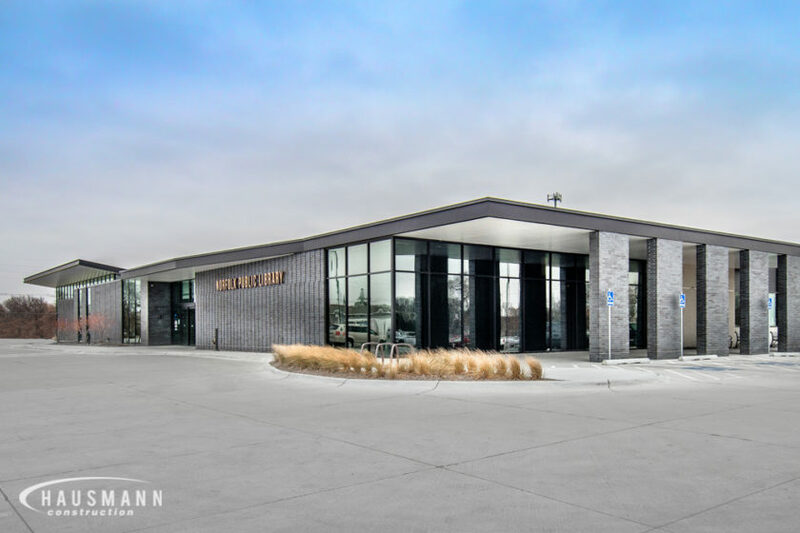 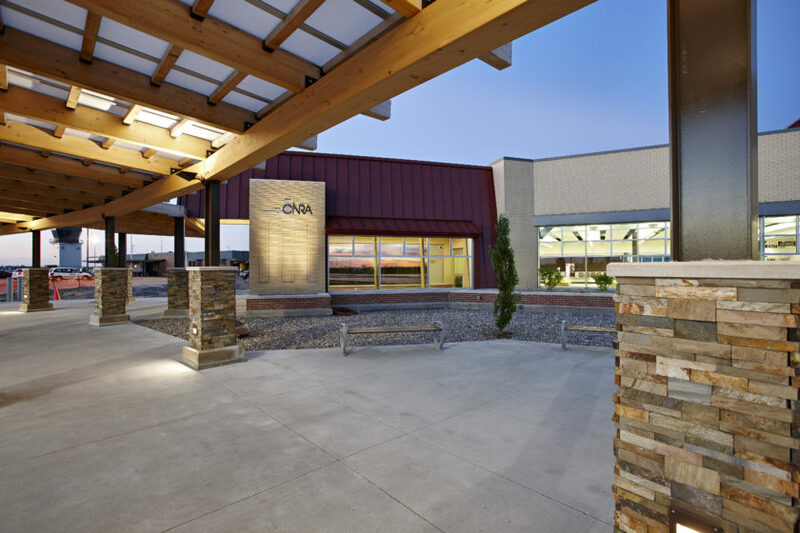 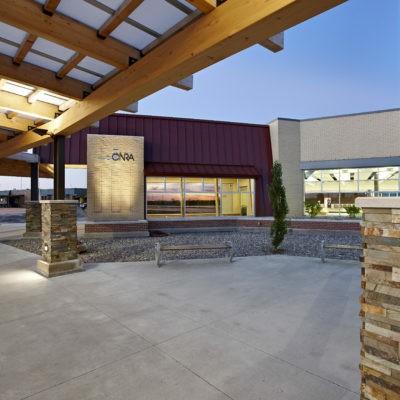 The Central Nebraska Regional Airport New Passenger Terminal project located in Grand Island, Nebraska features a new 34,000 square foot terminal, with two gates, designed to accommodate 120,000 annual passengers. 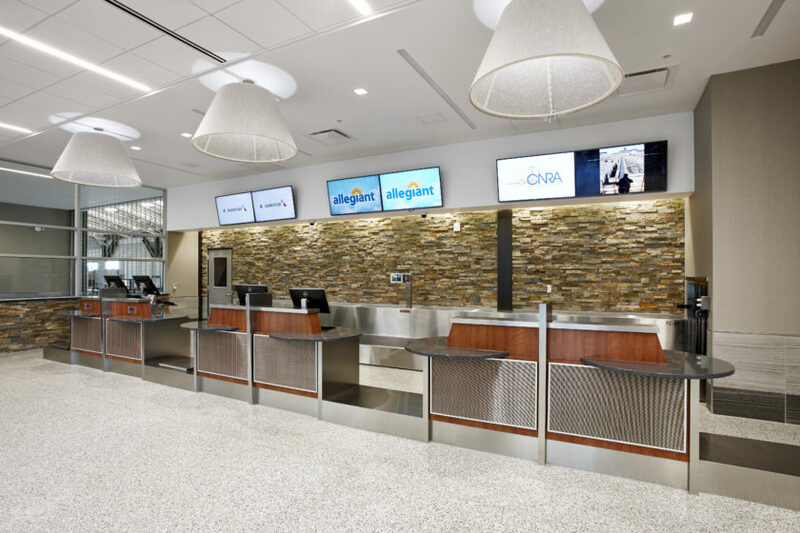 The terminal has open sightlines that provide travelers with a visual connection to all aspects of the airport experience. 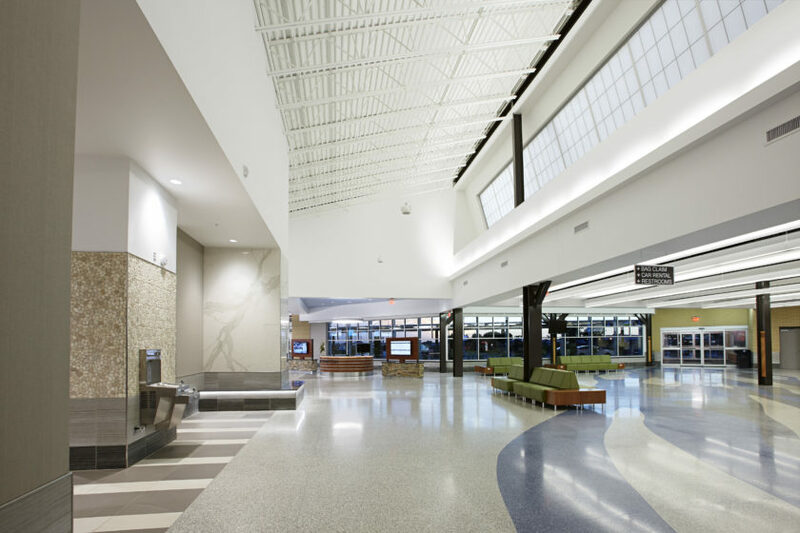 Many of the interior walls are glass to allow a line of vision from ticketing, security, restrooms, baggage claim and exit lanes. 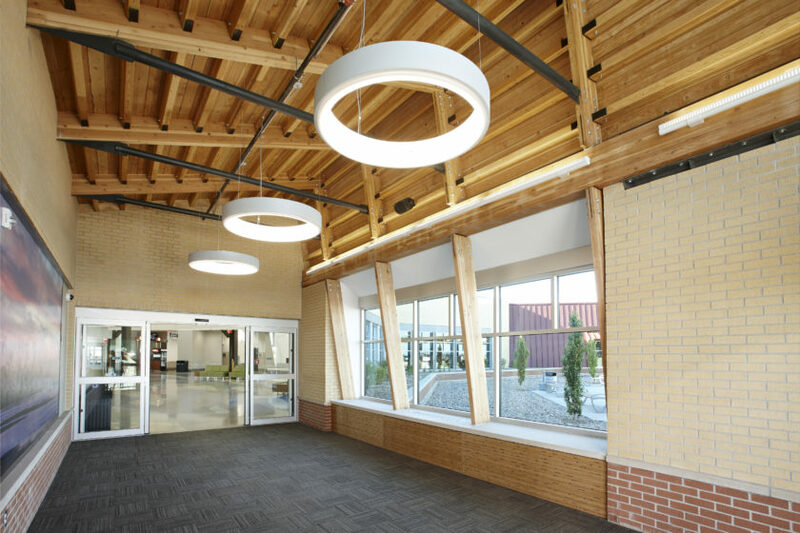 The project was designed for growth and sustainability. 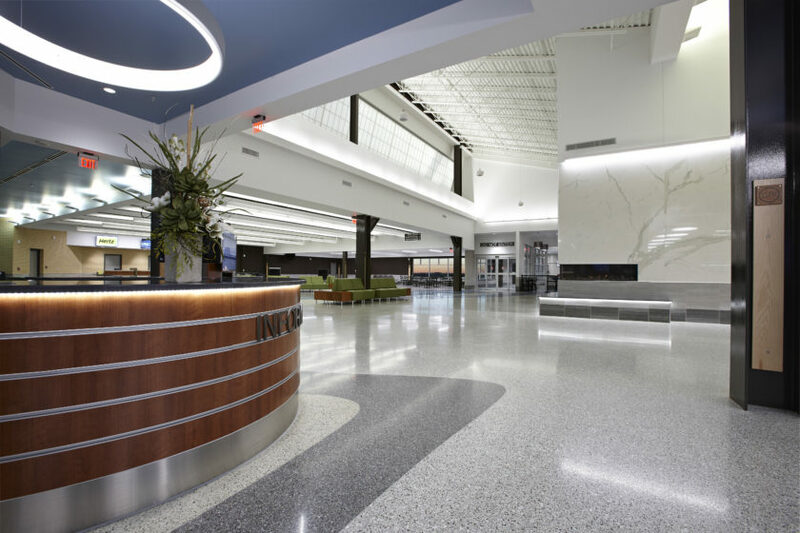 Resembling the Platte River, the terrazzo flooring showcases the region’s character and helps guide passengers through the terminal. 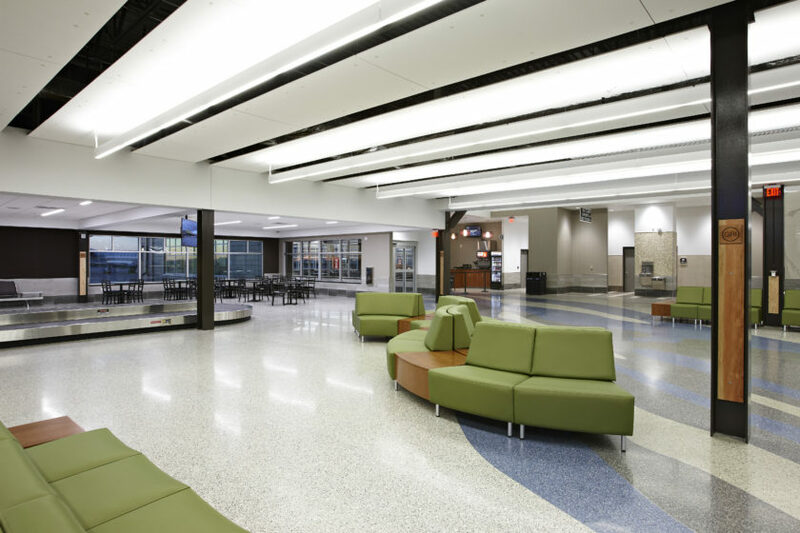 The project also added the airport’s first passenger boarding bridge and additional parking spaces. 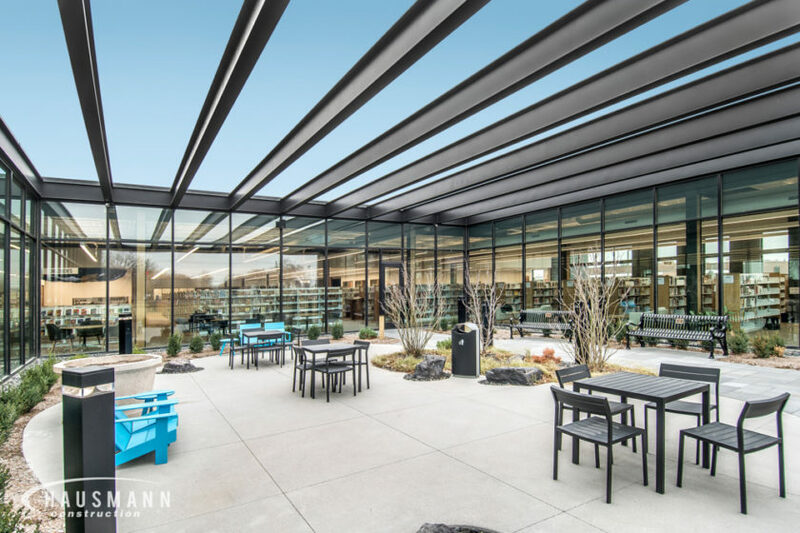 The exterior of the building features an aesthetically pleasing glu-lam canopy and the building’s saw-tooth roof allows natural light to stream in with minimal heat gain. 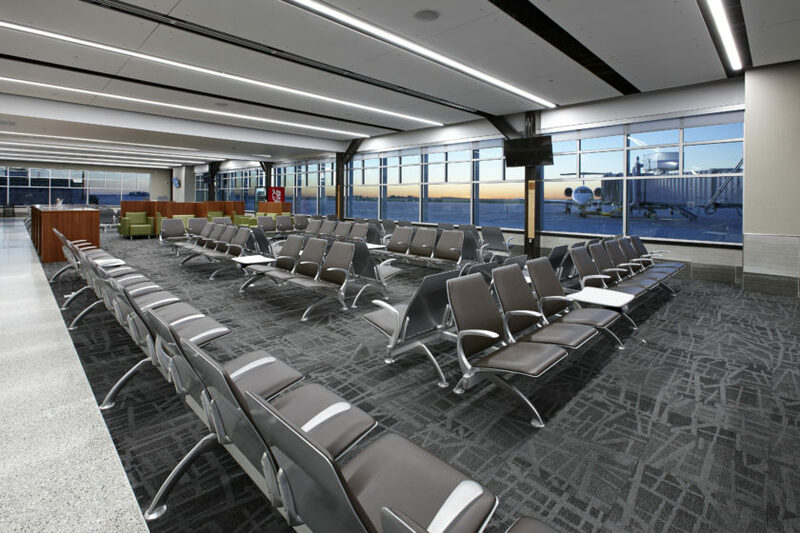 New technology and modern finishes make the airport a convenient and ideal choice for passengers anywhere in the region. 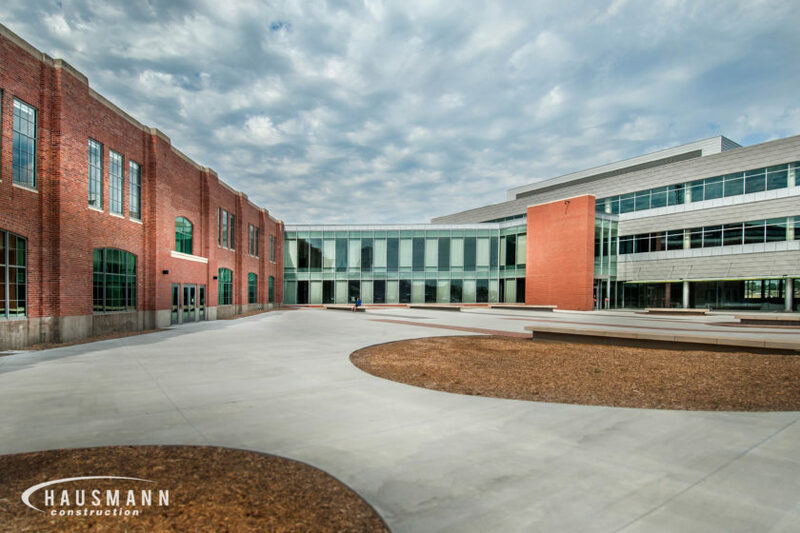 Photos courtesy of Mead and Hunt. 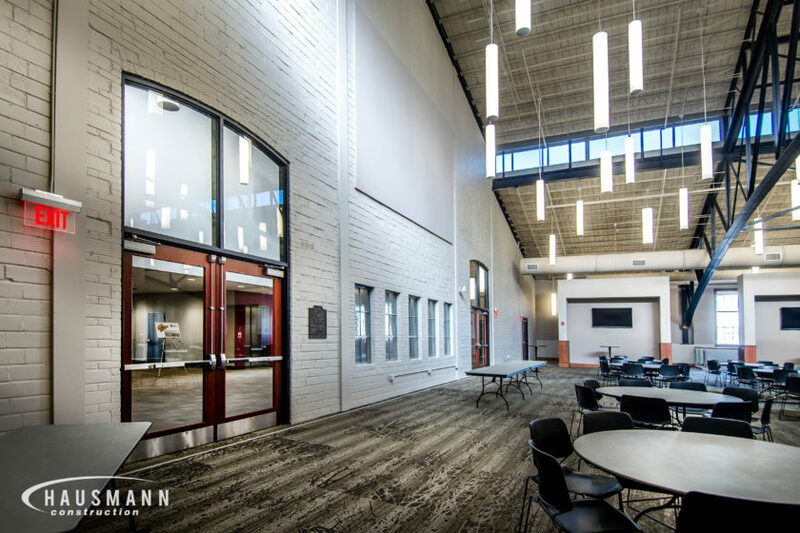 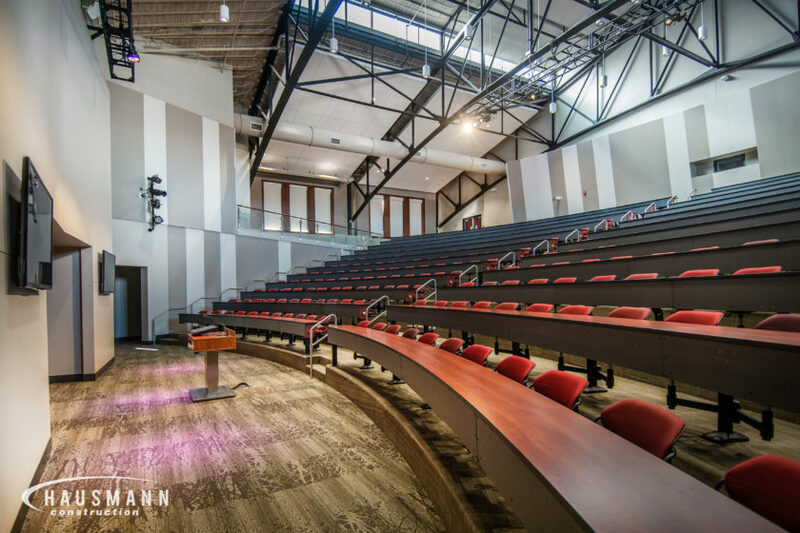 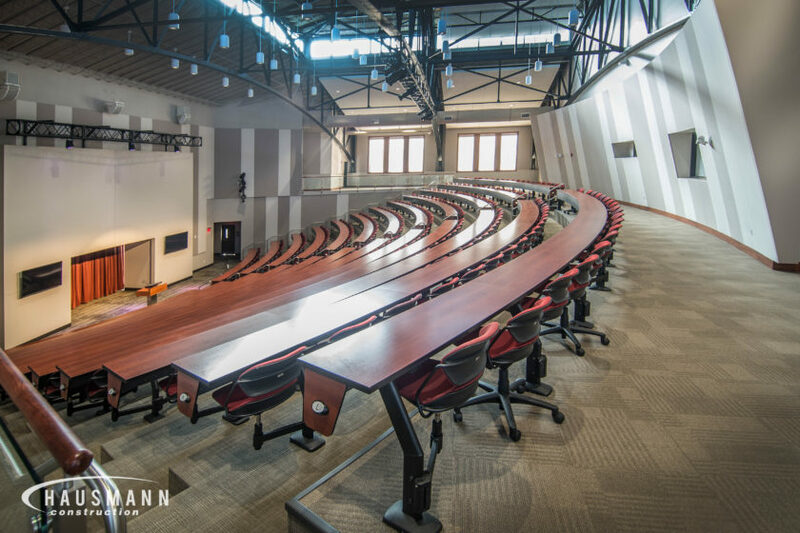 The 4H Building renovation includes a new conference center for Nebraska Innovation Campus with a 400 seat auditorium, conference break out rooms and ballroom. 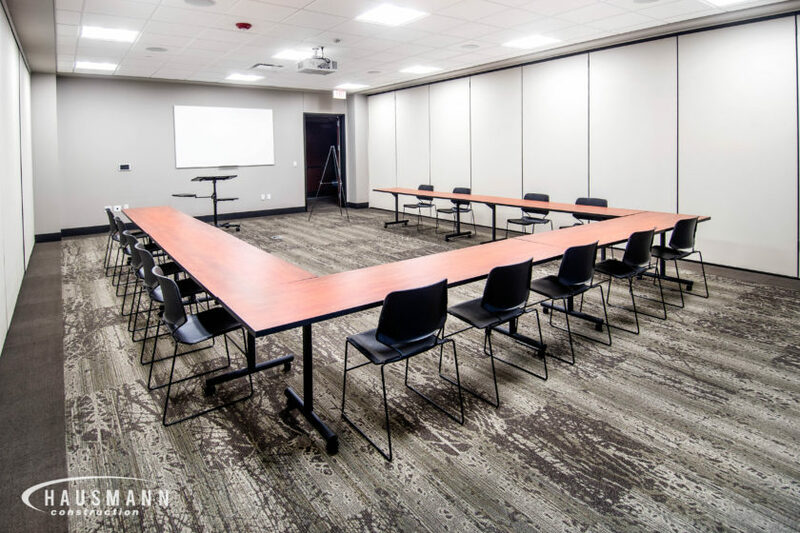 Leasable office space is also available in the building. 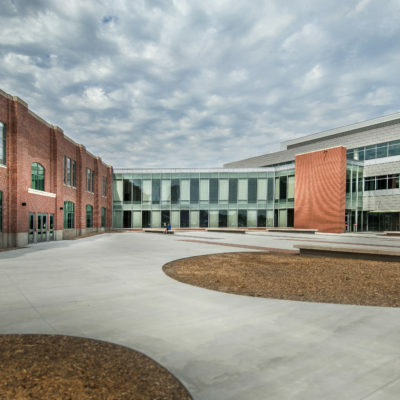 The existing 70,000 square feet building is two stories tall. 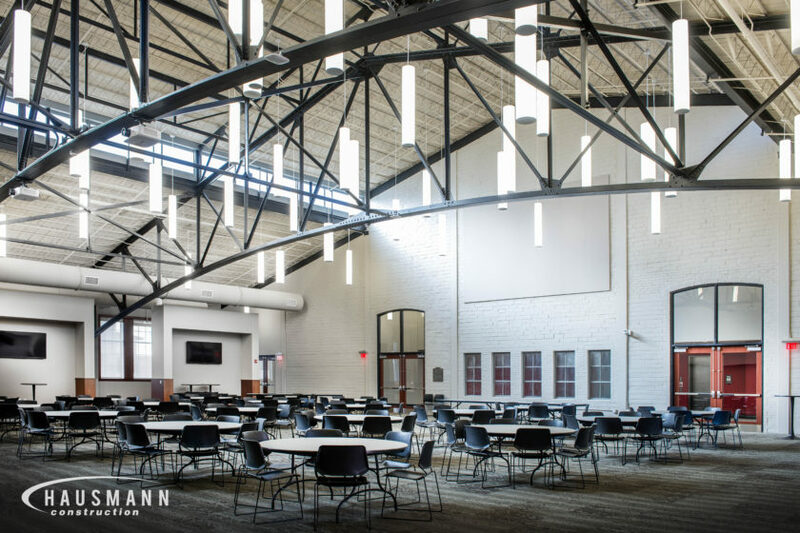 The original high bay trusses were restored and became a feature of the conference space. 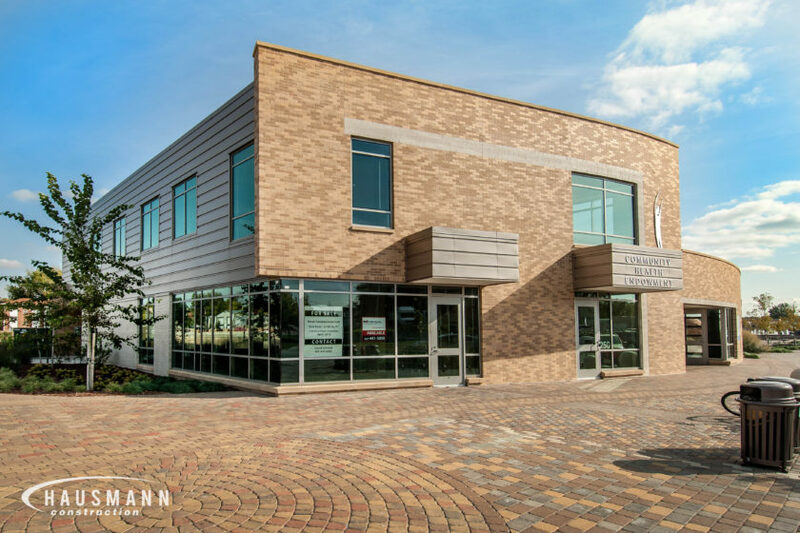 Exterior renovation of the building included tuck pointing and cleaning of the original brick masonry, window replacement that is respectful of the original design and new roofing. 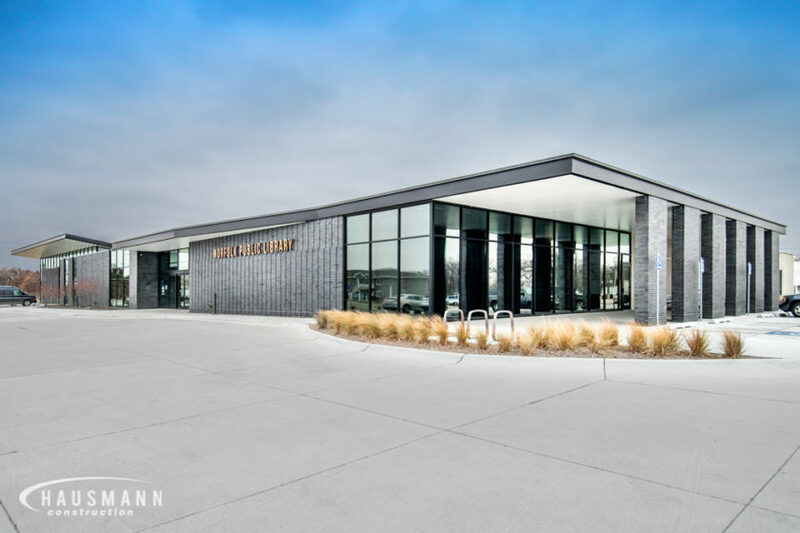 Connected to the former 4H building via a two-story link is the new, three-story NIC office building that includes approximately 80,000 square feet of office lease space as well as 3,000 square feet in retail space on the first level. An open plaza is located between the two buildings and serves as the heart of the entire Innovation Campus and the home for outdoor concerts, gatherings and overflow conference space located in Lincoln, Nebraska. 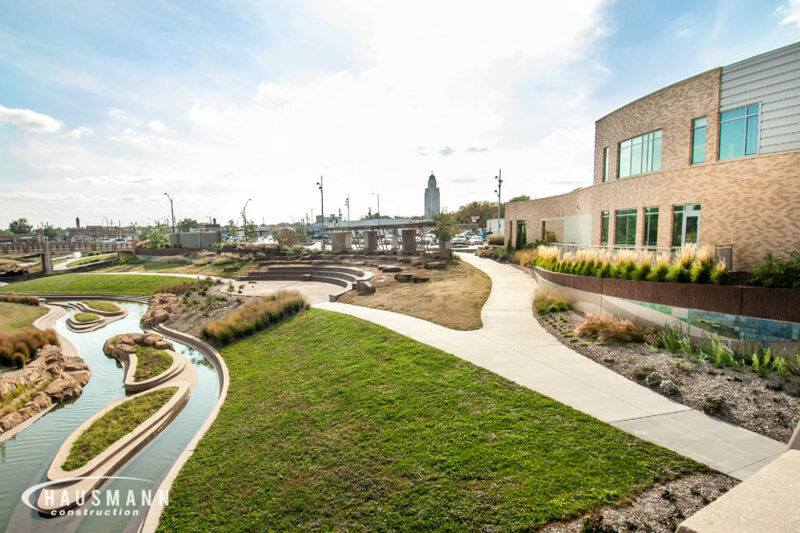 The Antelope Valley Union Park Plaza features a meandering waterway with numerous crossings and serves as a flood control tool for Lincoln, Nebraska. 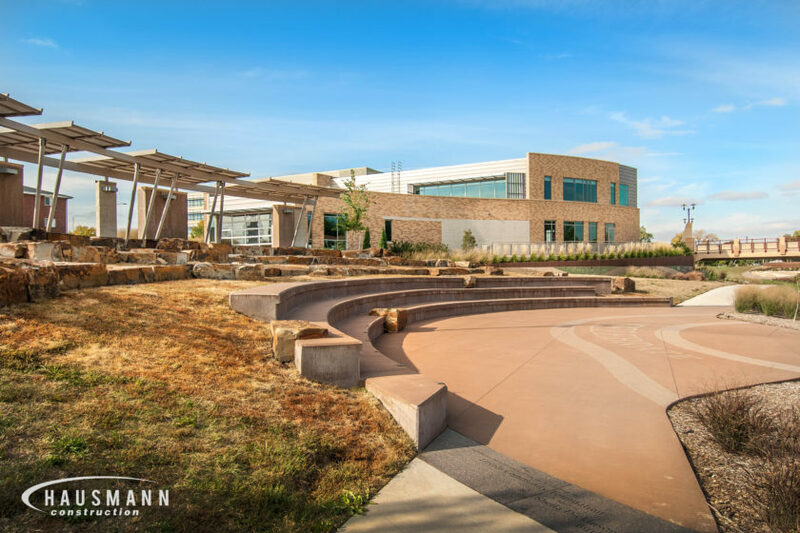 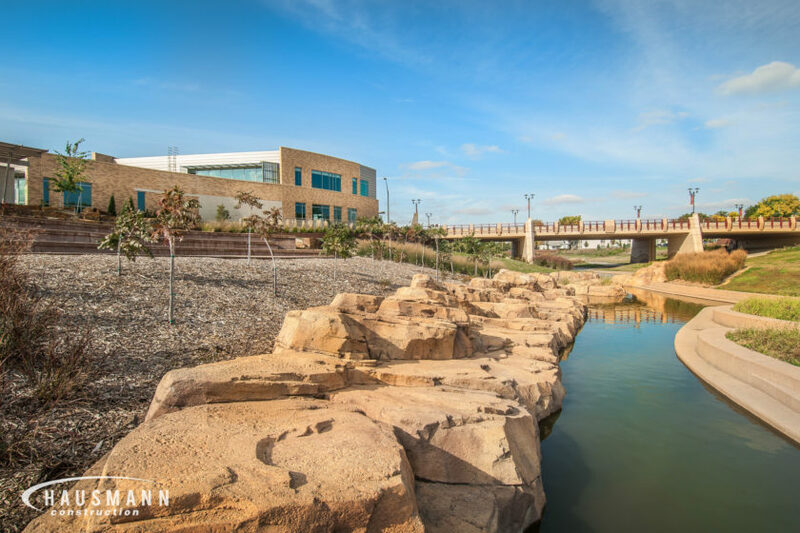 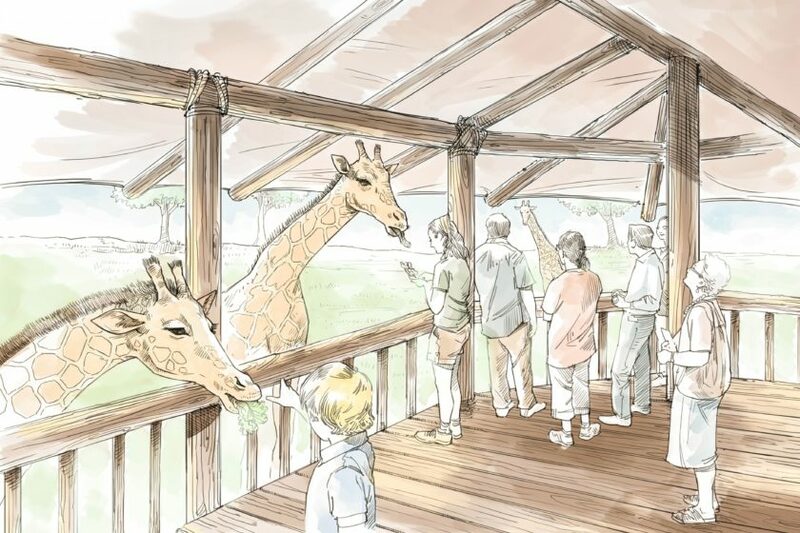 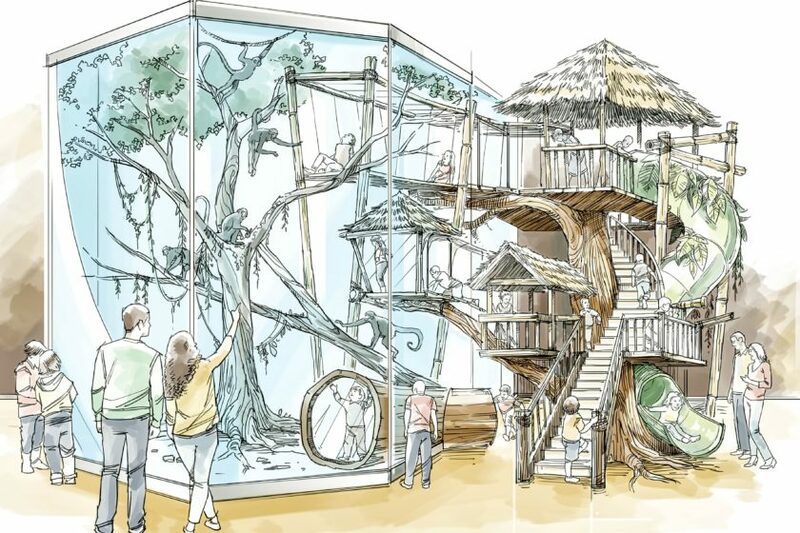 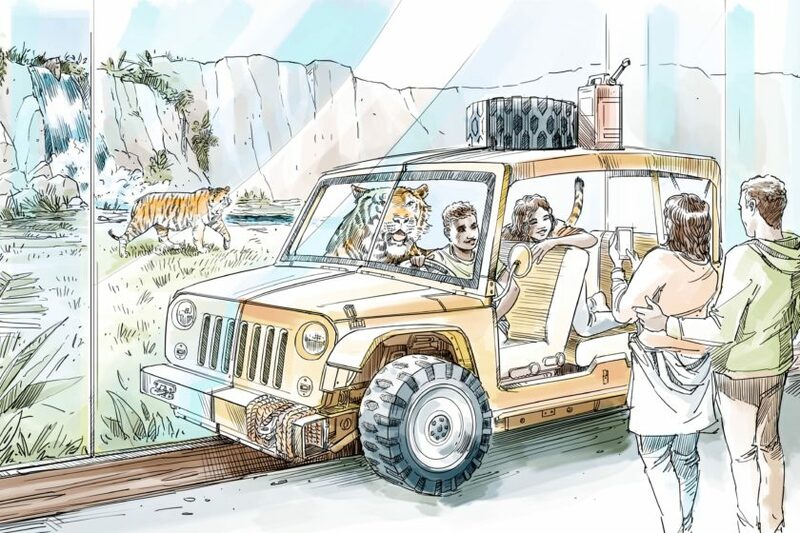 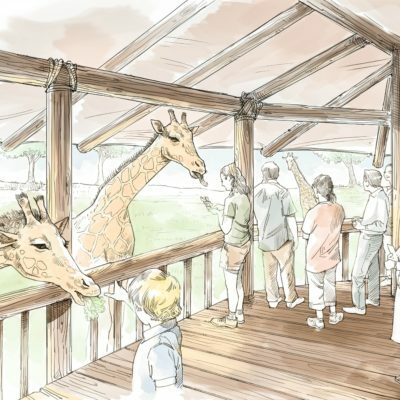 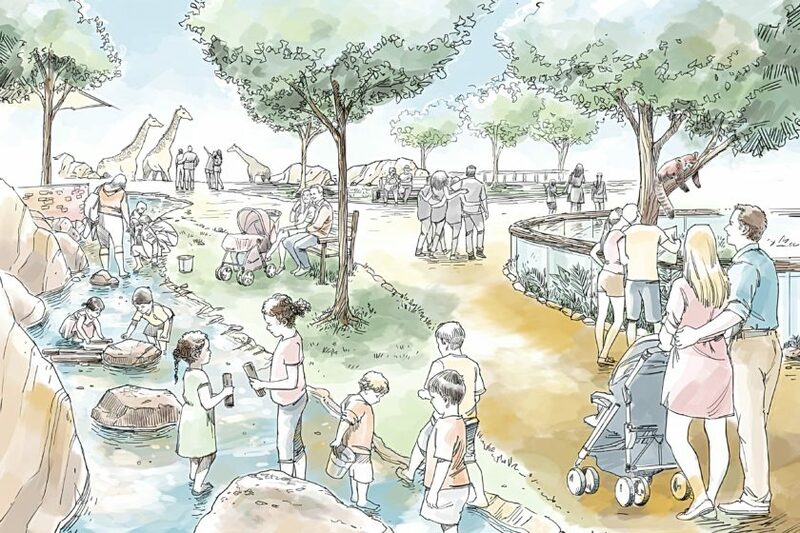 It also features public art, three fountains, a large plaza, a scenic overlook, an amphitheater with seating for 200, a playground and paved trails that connect to the city’s existing system. 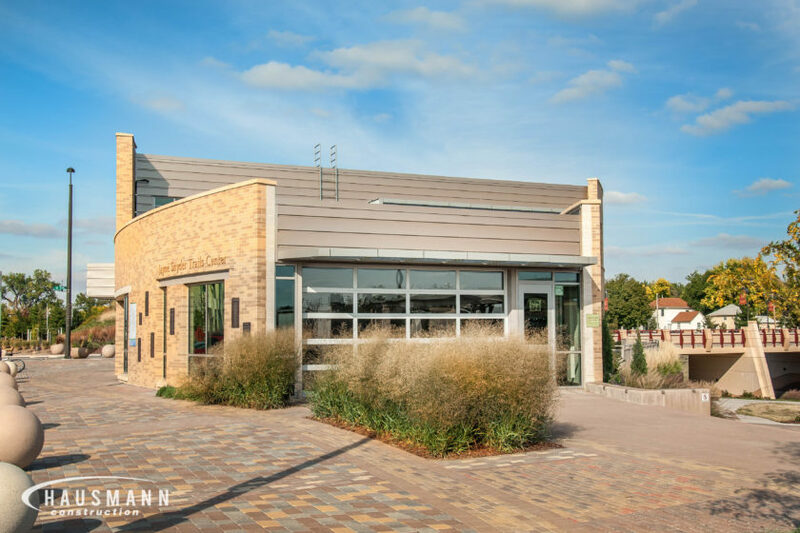 The plaza stretches over three blocks and offers amenities for festivals such as restrooms, seating, audio and power sources, recycling/trash receptacles and lighting. 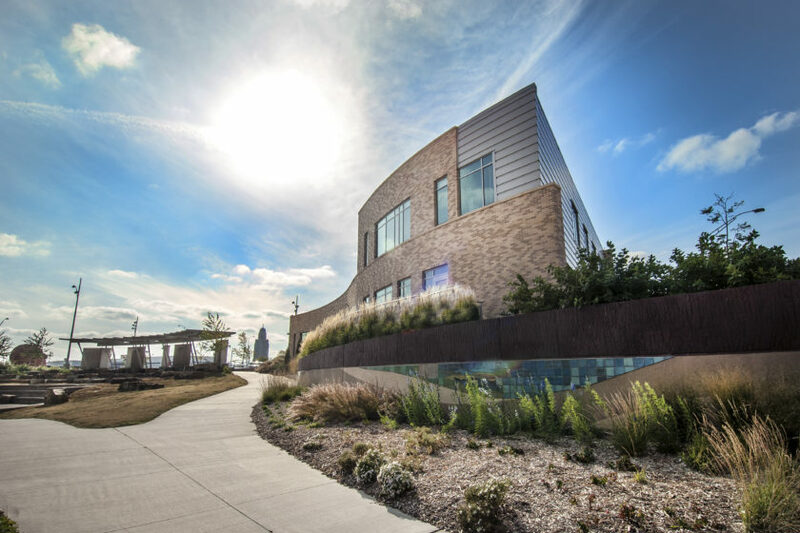 Sustainable elements include water conserving nozzles and LED lights in fountains, photovoltaic cells to power lighting and permeable pavers as well as Silva cells to manage runoff and support street-side trees. 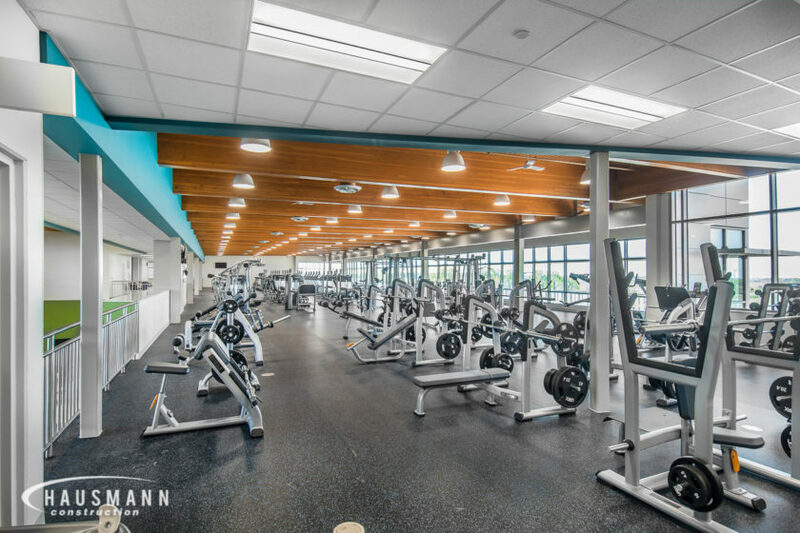 Hausmann constructed the new Jayne Snyder Trails Center inside the park. 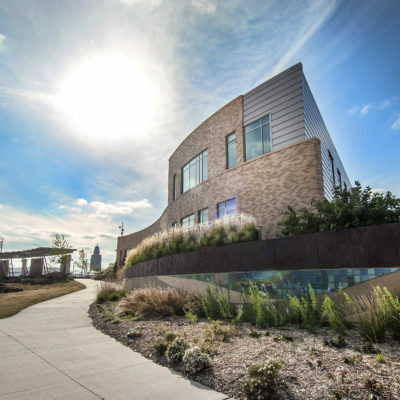 The two-story building serves as a hub for city trail users and provides a public meeting space (with a “garage style” door to open to the plaza), restrooms, retail space and offices for a community health organization. 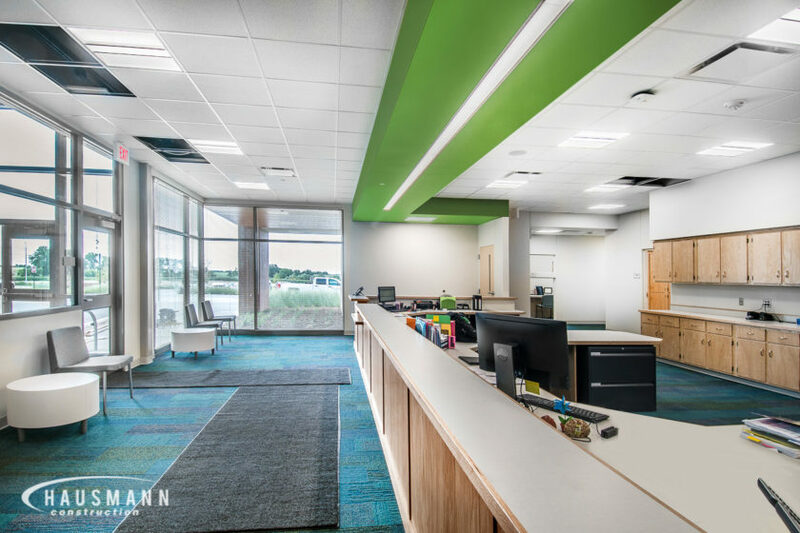 Design & Development by Oxide Design Co.